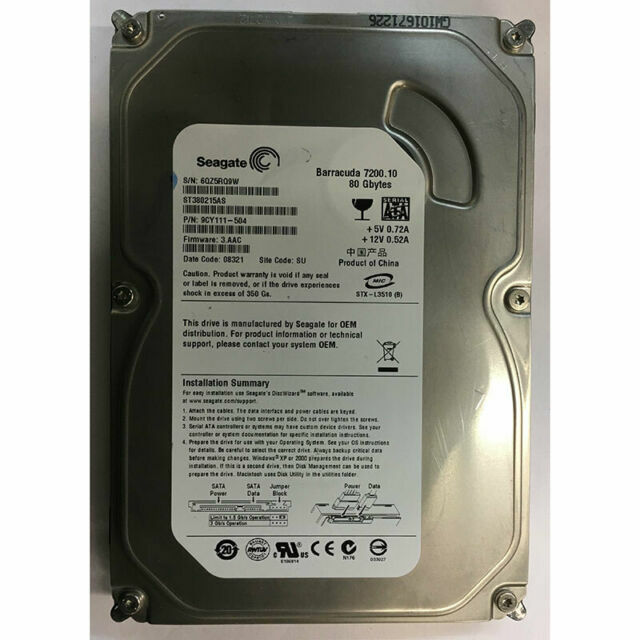 This Seagate 80 GB hard drive is reliable, quick, and designed for delivering a great deal of extra disk space for all your needs. Hobbyists and hardware enthusiasts admire the functionality and dependability of this Seagate 80 GB hard drive. The Seagate Barracuda is a capable option for upgrading to a better hard drive. The sufficient storage capacity featured on this internal 3.5-inch hard drive allows you to keep your whole family's software applications, large files, and mp3 files with peace of mind. Copy tons of MP3s, documents, and photos in the blink of an eye using the blazing 7200 RPM speed included with this Seagate 80 GB hard drive. As the Seagate Barracuda has a 2 MB RAM buffer, you can reach impressive data access speeds when you're copying files, analyzing information, or loading software. With solid construction, this internal 3.5-inch hard drive is very durable, allowing you to enjoy many years of trouble-free performance without worrying about mechanical breakdowns or component failures. Plus, the Seagate Barracuda is easily installable, which means you are able to promptly hook it up to devices supporting the Serial ATA II standard.